The North West Company crest - "Perseverance"
When Meriwether Lewis and William Clark stayed at the Mandan villages during the late fall and winter of 1804-1805, they were surprised to find that they were not the only white men there. 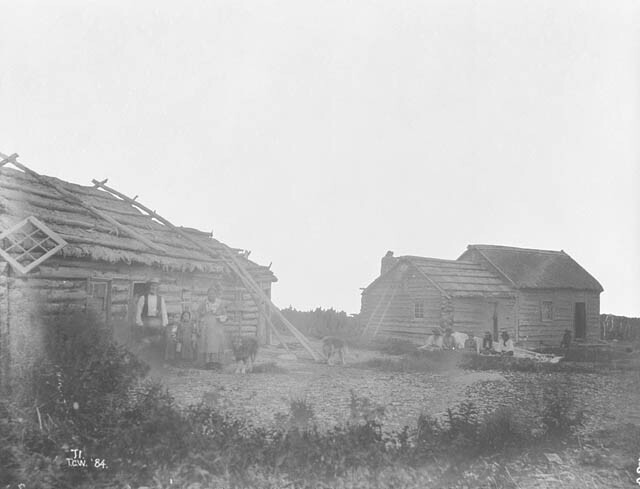 Clark wrote in his journal in November 1804, “Cap lewis visit the Me ne tar rees, the 25th and returned the 27th of Nov. with 2 Chiefs &c. &c. and told me that 2 Clerks & 5 men of the N W Company & Several of the hudsons Bay Company had arrived with goods to trade with the indians a Mr. La Roche & Mc Kinzey are the Clerks.” Lewis had just met Charles McKenzie and François-Antoine Larocque of the North West Company. And he wasn’t happy about it. 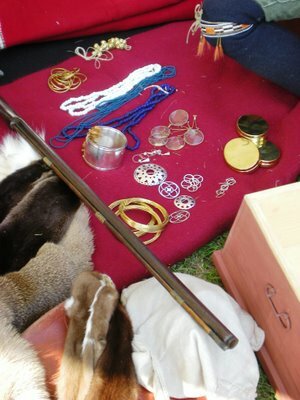 Based in Montreal, the North West Company provided trade goods such as blankets, guns, powder and lead, knives, kettles and pots, cloth, jewelry, food, spices and whiskey to the Indians, in exchange for valuable furs for the European market. The Hudson’s Bay Company, headquartered in London, played a similar role in the fur trade, though they also provided rifles to their best customers—including the Blackfeet. Lewis and Clark found that at least a dozen Canadian traders representing the North West Company and the Hudson’s Bay Company were ensconced in the earth lodge villages alongside them that winter. It was a recipe for tension. As part of the Louisiana Purchase, the Mandan Villages were technically American territory, and Lewis & Clark were not pleased to find the Canadians trading there. In reality, there was little they could do about it. Trade was one thing, but there was something else they simply could not tolerate. They believed the Canadians were giving British sovereignty medals to the Mandans and Hidatsas. As newly minted American subjects, only Jefferson peace medals were allowed. Despite the tense rivalry, Charles McKenzie and François-Antoine Larocque were frequent callers at Fort Mandan that winter. Sergeant Patrick Gass concluded that the North West Company men were more interested in keeping an eye on Lewis & Clark than in enjoying the pleasure of their conversation. In fact, Larocque asked several times if he might accompany the Corps of Discovery when they resumed their journey west. Lewis & Clark politely blew him off. Struggling to plant the seed of American sovereignty in the Louisiana Territory, they saw little advantage in providing transportation, protection, and inside information on their discoveries to a Canadian merchant in the pay of the British. 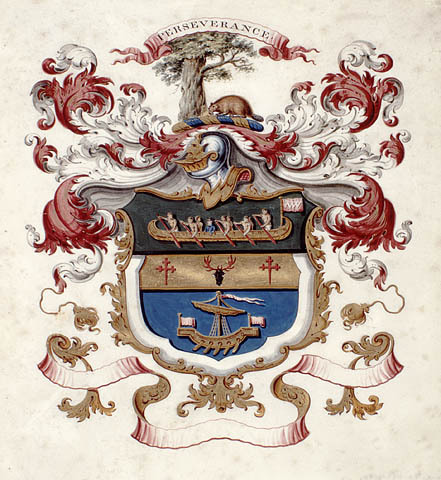 Hudson's Bay Company crest - "A skin for a skin"
Offensive or not, Lewis and Clark were unsuccessful in discouraging the North West Company men, and they and their counterparts in the Hudson’s Bay Company were fixtures in the Indian fur trade network for decades to come. The North West Company endured through the 1810’s, when the destruction of a major fur trading post at Sault Ste. Marie by the Americans during the War of 1812, along with a decline in the beaver population due to over-harvesting, dealt a serious blow to their fortunes. In 1821, they merged with the Hudson’s Bay Company. 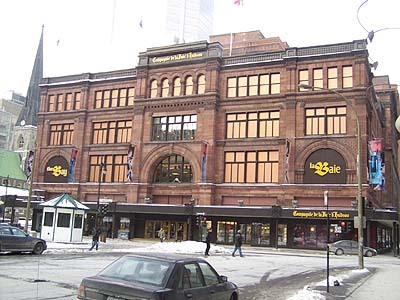 As for the Hudson’s Bay Company, it still exists, the oldest commercial corporation in North America. Today the company is best known for operating popular department stores throughout Canada, including The Bay, Zellers, Home Outfitters, and Fields. The Hudson’s Bay Company Archives, located in Winnepeg, Manitoba, is considered one of Canada’s national treasures. It is a treasure trove of information on the era of the fur trade and early exploration in North America, and contains fascinating, detailed records of the company’s activities from its chartering in 1670 to the present. Meriwether Lewis might take satisfaction in knowing that the company is now American-owned. Eric, congratulations on your book. The early blurbs are terrific and the cover looks awesome. This is definitely one I would like to read. The fur trade is such a hard era to make sense of, and I look forward to reading your take. How long did it take you to research and write the book? Thanks for your interesting comments. You might be interested in historian Barry Gough’s latest book on this subject: “Fortune’s a River”. The particular emphasis in this book is on the influences and responses of David Thompson and the Canadian fur traders to the Lewis & Clark expedition. There is a quite revealing exchange of correspondence between Thompson and a supposed agent of the US government apparently operating under a variety of Dickens-style nom de plumes. Gough confirms that this correspondence, which could almost be considered hilarious if it was not so threatening, was no hoax. Indeed, some tragic outcomes of the Lewis & Clark expedition bear witness to this (the virtual extermination of the native peoples within what eventually became the United States). Hal, thank you very much for the recommendation of “Fortune’s a River.” I was unaware of the book and it sounds very interesting. The international struggle for possession of this continent is so little understood by most people, though it’s fascinating and essential to really understanding the history of the United States. I’d be interested to know who that secret agent was. I don’t agree that the extermination of the native peoples was an outcome of the Lewis & Clark Expedition per se, though no one could disagree it was a result of westward expansion. I plan to blog about this in a future post. And how else (but through that Twitter contact) would I have discovered your wonderful blog. You’re going on my More Cool Blogs blogroll! Thanks for the contact, Frances. Thanks for the kind words. It took me about two years to research and write FUR, FORTUNE, AND EMPIRE. It was tough, but fun. There is so much great information on the fur trade that the most difficult thing about writing the book was deciding what to put in it. If I had included every great story I came upon, the book would have been 1,000 pages, and nobody would have read it! Thanks again. Please spread the word about the book (on your blog and other places), and if you are near where I will be speaking, please stop by (the list of my talks is on my website — http://www.ericjaydolin.com, under tour dates). Interesting post! I didn’t know that Lewis and Clark ran into Canadians on their adventures but it’s really not surprising. In fact, in researching the history of Idaho, I learned that the British set up two historic forts in Idaho, Fort Boise and Fort Hall. These were important to Oregon Trail travelers. They were both operated by the Hudson’s Bay Company. I’ve got my own story to tell which I would like to have published. I’m a direct descendant of Hon. William McGillivray Lord of the NorthWest Company. 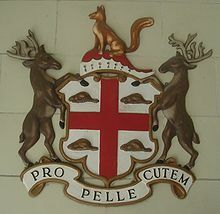 I was sent an active Crown Patent for 12,000 acres of North & South Plantagenet, Upper Canada present day Ontario. I am Metis with Treaty Status. This has been detrimental to some degree. Upon arriving to this area we have discovered there is no recognition my ancestor had gone up & down the Grand River (present day Ottawa River). He would have definitely picked a central location between Ottawa & Montreal for a country residence because it is 1/2 between both. Additonally, he was given another piece of property in the Indian Territories west of London, Ontario for which I have not posted the map called McGillivray Township but that is not the property I am attempting to have a McGillivray NorthWest Museum built on with statues for McGillivray & family. I have emailed the whole board of directors of present day NorthWest Company to ask them for help because they advertise using my family’s proud history & infringe upon using trademarks & logos without permission. I have asked to meet with them to have a seat on the board but with no response. My family tree is documented & would stand up in court. In my view there has been a conspiracy of silence to have this remain silent. I contest & proclaim loud & clear Hon. William McGillivray was the founding Father of Canada because his Company had used surveyor David Thompson to map out much of western Canada. Please review my blog. I am campaigning to raise funds.